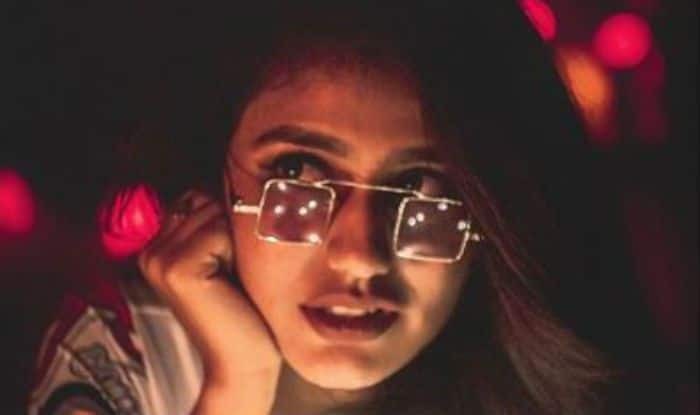 Malayalam actress and Internet wink queen Priya Prakash Varrier have recently shared a couple of pictures from her latest photoshoot. Giving the spirit of the festive season, Priya is seen surrounded by fairy lights giving an edge to her look. Dressed in a white printed shirt and a woollen hat, she has accessorised her looks with funky aviators. Her pose game is bang on, as always. Recently, Priya has become the most searched personality of the year, leaving behind Sunny Leone. She never misses to impress fashion police with her sartorial choices and carries each outfit with utmost grace and elegance. Earlier, she has shared pictures from her photo shoot in a velvet maroon gown with a high slit. Needless to say, she looked stunning in her latest pictures. The lovely Priya Prakash Varrier became the talk of the town and the ‘national crush’ thanks to the Manikya Malaraya Poovi video from her maiden Mollywood film Oru Adaar Love that went viral. In the romantic video, she was seen winking at her on-screen lover and redefining the meaning of cuteness. As expected, the wink and cute expressions made the teenager an overnight sensation. Speculations were rife that she was planning to make her Bollywood debut and Karan Johar was keen to launch her. However, it turned out to be mere rumour. Priya has received a huge fan following even before her debut film, all thanks to a wink and flash of a smile in the teaser of her debut film Oru Adaar Love. Oru Adaar Love is a romantic drama that features Priya Prakash Varrier, Siyadh Shajahan, Roshan Abdul Rahoof, and Noorin Shereef in lead roles. Helmed by Omar Lulu and produced by Ousepachan Vaalakuzhy, this Malayalam flick’s music is composed by Shaan Rahman.